NIU’s STEM Read is taking advantage of a new partnership with WNIJ, northern Illinois’s public radio station, to share staff and faculty expertise through a new platform: the STEM Read podcast. The podcast, which debuted on Friday, Oct. 13, allows NIU faculty and staff to reach a wider audience of K-12 educators and librarians, as well as anyone who loves books and science. Since 2011, STEM Read has connected Illinois K-12 educators and students with NIU staff and faculty, as well popular fiction writers. Through live and online programs—ranging from interactive field trips to teacher professional development—STEM Read has inspired young readers to learn more about the science, technology, engineering and math concepts in popular fiction books. They’ve also been inspiring and instructing K-12 educators to incorporate STEAM-based interdisciplinary learning and technology into their classrooms. The STEM Read Podcast includes interviews with authors, STEM experts and educators. Each episode focuses on a hot topic in education. Experts dive into the topic and share their insights, and then authors discuss books that can act as a gateway for further exploration. Dr. Kristin Brynteson, director of Professional Development for NIU’s Center for P-20 Engagement, is excited to partner with King-Cargile to spark creativity with the new podcast. Dr. Kristin Brynteson and Gillian King-Cargile recording an episode of the STEM Read Podcast. 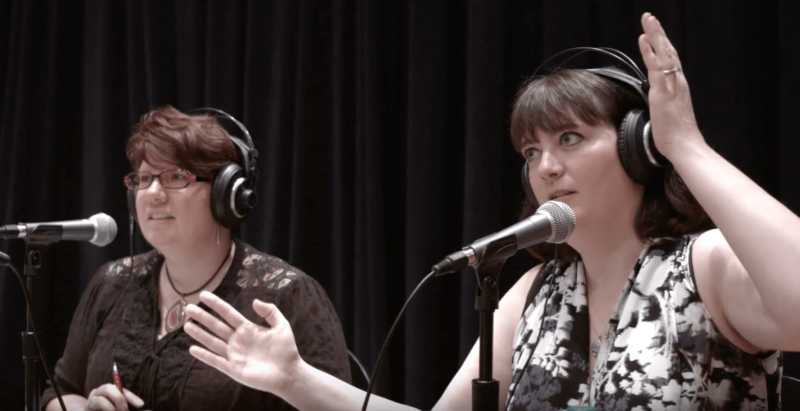 The STEM Read Podcast also gives King-Cargile and Brynteson the opportunity to partner once again with radio station WNIJ, northern Illinois’s local NPR affiliate. They previously partnered to create and broadcast STEM Read’s reimaging of The War of the Worlds. WNIJ Host/Producer Carl Nelson is working with the STEM Read team to help record and produce the podcast, which they say wouldn’t have been possible without him. Upcoming episodes include interviews with authors Mike Mullin (the Ashfall trilogy), Aaron Starmer (Spontaneous) and M.T. Anderson (Feed), as well as experts such as Erika Gebel Berg of the American Diabetes Association and NIU Professor of Cognitive and Educational Psychology Joseph Magliano. The first and second episodes of the STEM Read podcast are available through NPR’s Podcast Directory, the iTunes Store and the Northern Public Radio website at http://northernpublicradio.org/topic/stem-read-podcast. New episodes will be released the second and fourth Friday of every month. STEM Read is part of NIU’s Center for P-20 Engagement in the Division of Outreach, Engagement and Regional Development. With questions or for more information, contact Gillian King-Cargile at gkingcargile@niu.edu or 815-753-6784. See the STEM Read podcast video on YouTube.